A sinkhole in Wyoming where countless Ice Age animals fell to their deaths is finally being opened to scientists. A veritable paleontological trove, the 85-foot-deep pit contains the bones of tens of thousands of animals – some of which lived more than 100,000 years ago. 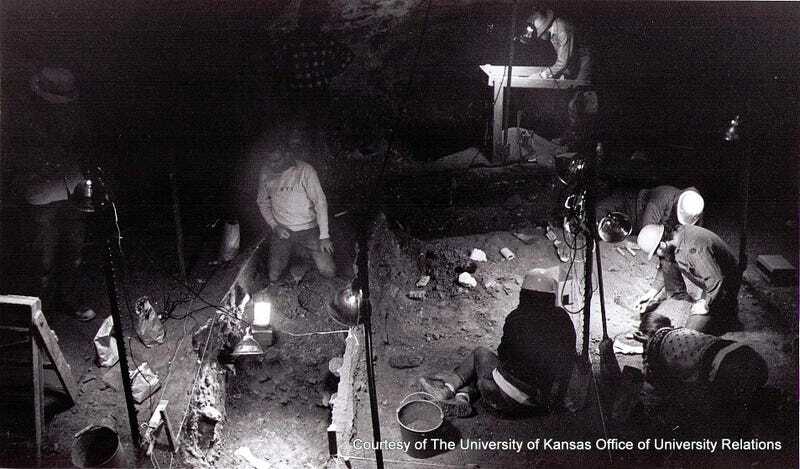 Above: A crew from the original Natural Trap Cave expedition | Photo Courtesy University of Kansas. Natural Trap Cave in north-central Wyoming is 85 feet deep and almost impossible to see until you're standing right next to it. Over tens of thousands of years, many, many animals — including now-extinct mammoths, short-faced bears, American lions and American cheetahs — shared the misfortune of not noticing the 15-foot-wide opening until they were plunging to their deaths. Now, the U.S. Bureau of Land Management is preparing to reopen a metal grate over the opening to offer scientists what may be their best look yet at the variety of critters that roamed the foothills of the Bighorn Mountains during the planet's last glacial period around 25,000 years ago. Des Moines University paleontologist Julie Meachen said she has been getting ready to lead the international team of a dozen researchers and assistants by hitting the climbing gym. "I'm pretty terrified," Meachen admitted Wednesday. WE VOLUNTEER AS TRIBUTE! These kinds of caves are remarkable sites of paleontological discovery. What we wouldn't give to do a little exploring. Read more about the Natural Cave Trap here.